I still remember the first day I saw Allan McNish race. It was in a Scottish Formula Ford championship race in 1987 and it was only his third ever car race. The championship at that time had a lot of really good drivers and large grids. They used to get so many entries that they had to run a qualifying race for the slower drivers with the top four qualifying for the championship race. It was rare for new or young drivers to make any impression until they had served a suitable apprenticeship. I have only twice in my life gone to a race meeting and seen a driver I had never heard of and walked away convinced that I had seen someone really special. There was something very different about Allan McNish compared to previous young Formula Ford drivers. Firstly the circuit commentator clearly knew all about him and secondly he was driving an Ecurie Ecosse car. Ecurie Ecosse is a legendary Scottish motor racing team that is most famous for winning the Le Mans 24 hours in 1956 and 1957. I still remember watching him and thinking that this kid is something special. He ran at the front for most of the race and then slightly blotted his copybook. The lovely dark blue Ecurie Ecosse Mondiale car that he started the race with was converted to shrapnel going up through the Ingliston esses. You can probably still find bits of it embedded in the trees. Regardless of the accident I was convinced that I had seen a future star. The following year despite only having done a few scattered Formula Ford races following a very successful karting career which included 6 Scottish championships and 3 British championships he found himself driving in Formula Vauxhall Lotus for Dragon Motorsport. The drive was fully sponsored by Marlboro and his team mate was a Finnish prospect called Mika Häkkinen. Häkkinen was to focus on the European Opel-Lotus championship with McNish concentrating on the British Vauxhall-Lotus championship. Where there were non-clashing rounds they would drive in each other's championships. Allan finished that season as British champion and impressed a lot of people including his sponsor. For 1989 Marlboro had one fully sponsored British Formula 3 Championship seat available and chose McNish for it rather than Häkkinen. Just think about that for a second. Mika Häkkinen was the driver Michael Schumacher looked on as his biggest competitor and Allan McNish was chosen ahead of him by Marlboro who knew a thing or two about which drivers to back. The plan was that Allan would have a learning season in 1989 and the following year he would be expected to win the F3 title or at least go very close to winning it. He ruined this plan by winning the title in the first year despite an accident at Brands Hatch where he rolled in qualifying and bashed his head. This resulted in Professor Sid Watkins banning him from racing for a month and missing a couple of races. His championship victory, however, only lasted until the following February when he lost it to David Brabham on a technicality. Following his Formula 3 success Marlboro moved him up to Formula 3000 with the French DAMS team. This promotion freed up a seat in F3 for Mika Häkkinen who won the championship after a fabulous season long battle with Mika Salo. By now McNish was rated as one of the best prospects in Europe and people were talking of him as a future world champion. His F3000 campaign got off to the worst possible start. At Donington his car left the track and landed in an underpass killing a spectator. Despite what must have been shocking for someone who was only 20 years old he recovered from this experience to win the next round at Silverstone taking pole and fastest lap on the way. He finished the season fourth in the championship which was won by his team mate Érik Comas. Nowadays we are used to young drivers spending time as test drivers for F1 teams. That was not always the case. The first young driver with a serious reputation to become an F1 test driver was Allan McNish when McLaren signed him. The trouble with him being the first was that it confused other teams. They all thought that McLaren had signed him and would give him a race seat sooner or later so there was no point in them offering him a race seat and when McLaren didn't offer him the expected race drive he was left high and dry as far as F1 was concerned. For 1991 McNish was the hottest F3000 championship favourite in a number of years. He was pretty much seen as a shoe-in for the title and a McLaren drive soon afterwards. Unfortunately that glowing future crumbled before our eyes because of a dog of a car called the Lola T91/50. Unlike GP2 where all the cars have the same chassis F3000 had competing chassis and engines. It very soon became clear that the Lola was the wrong car to have. The Reynard was vastly superior and most teams that had Lolas ditched them and bought Reynards. Unfortunately for McNish, DAMS were the works Lola team so he was stuck with just about the worst car on the grid. He went from fourth in the previous year's championship to scoring only 2 points all year. Christian Fittipaldi won the championship from Alex Zanardi with McNish in joint 16th. The most important thing in a young driver's career is momentum and McNish's momentum had just come to a grinding halt. 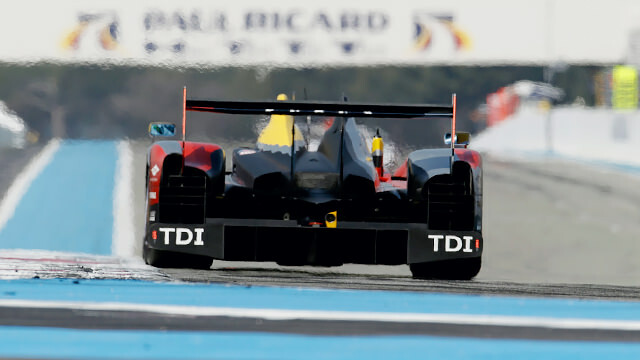 It seems ridiculous that one season in a bad car would affect a driver's career but it can. McNish went from "Allan McNish future McLaren world champion" to "Allan who?" in one season. He was still a McLaren test driver but not for long and although a Benetton testing contract followed it didn't lead to a race drive. His Marlboro sponsorship disappeared so he lost the DAMS drive. It seems crazy that having started the season as championship favourite he was dropped completely when he was quite clearly not at fault for the results. Over the next few seasons he did a some F3000 races in average cars along with his F1 testing duties. In 1996 he had a test for the PacWest CART (Indycar) team. He was told that the fastest driver would get a race seat and despite being comfortably faster he lost the drive to Mark Blundell. His career had hit rock bottom. He had no future in F1 or CART and had no drive in anything. He was offered a guest drive in the Porsche Cup race at the British GP. At each round of that championship there was always one or more guest cars available and no-one who drove those cars regardless of their ability and reputation was very successful due to the odd nature of the cars and the fact that they were competing against a grid full of specialists. McNish won his race and Porsche were so impressed they gave him a test and then a sportscar race drive. It shows how strange motor racing is that a driver who had a very good junior formulae career and a few years earlier had been chosen for a drive in preference to Mika Häkkinen coupled with experience of top F1 teams couldn't get a drive anywhere, but winning a single Porsche race resulted in a drive that led to a stellar sportscar career. He competed in two Le Mans 24 hour races in the Porsche 911 GT1 and in the second of those in 1998 he won the race with teammates Laurent Aïello and Stéphane Ortelli. As can probably be expected by now, things for McNish did not go smoothly from there. The normal path would have been to spend a few years as a Porsche driver and become established in sportscars. Instead of that he had one season as a Toyota sportscar driver before re-signing for Porsche at the end of 1999. Although Porsche had not competed at Le Mans that season McNish had still been racing for them in his debut season in the American Le Mans Series. It was by no means a successful season but it laid the ground work for what was to come. His second spell at Weissach turned out to be a lot shorter than his first Porsche career. The new car was uncovered at the Weissach factory. Marque legend Bob Wollek did between 10 and 15 laps then McNish did the same. The car was then put under cover and the program cancelled. With no drive for the 2000 season he signed for Audi and with the same two teammates from two seasons earlier he finished second at Le Mans. Although the Le Mans result was a disappointment, he won the ALMS championship taking 6 victories from 12 races. Having now established the basis for a successful sportscar career he finally got the F1 opportunity that he had spent most of his career chasing. Toyota had been so impressed with him in sportscars that they offered him a drive as team mate to Mika Salo. They would spend 2001 testing before entering F1 and finally making his race debut at the 2002 Australian Grand Prix. Given the view we all have of Toyota now it is very surprising to look back at the results of that season and aside from all the non-finishes there are a lot of finishes in 7th to 9th position. Salo even managed to pick up a couple of sixth places to score two points. This seems like a very reasonable performance and that is what most people thought at the time. Toyota, however, at the end of that season gave us the first indication that they had no idea how to succeed in F1 when they fired both of the drivers and replaced them with Olivier Panis and Christiano da Matta. Really good idea that was. McNish's F1 season is remembered mainly for his accident in qualifying in Japan. He had gone through 130R almost flat on his previous lap and was already up on that time so he decided that he would attempt to take it flat next time. He may have thought that he was capable of going through the corner flat but his car did not. He hit the barrier backwards and totalled the car. Had he hit it with the front of the car I dread to think what would have happened to him. Although he did no long term damage to himself he had to sit out the race which was a real shame as he was a bit of a Suzuka specialist. While at McLaren he spent a lot of time testing for Honda at Suzuka and knew the track really well. 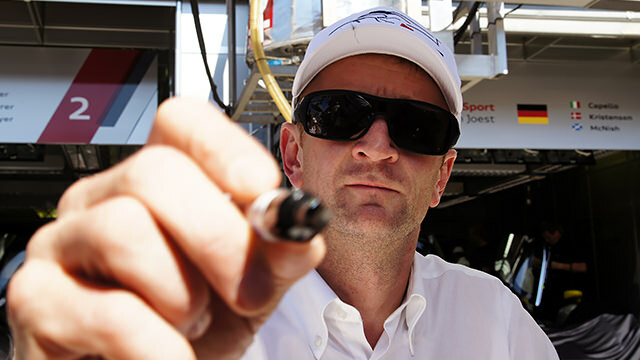 He spent 2003 as Renault's F1 test driver before returning to Audi in 2004 where he has been ever since. In 2004 and 2005 he only contested a few races. He won at Sebring in 2004 and took 3rd at the 2005 Le Mans race. In 2006 for the first time he was teamed up with Tom Kristensen and Rinaldo (Dindo) Capello. They took another third place at Le Mans and won the ALMS championship winning 7 out of 10 rounds including Sebring and Petit Le Mans. The championship was retained the following year despite only winning two rounds. 2007 was the last season he contested the full ALMS season. 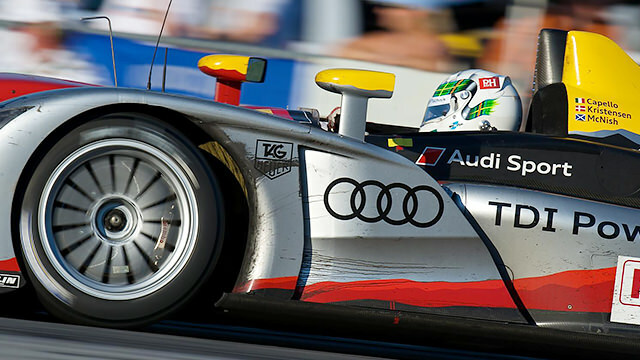 Audi continued to race at Sebring and Petit Le Mans with McNish winning the former in 2009 and the latter in 2008. 2008 also saw the long awaited second Le Mans win after a DNF the previous season. This victory was followed by another two third places then another DNF in 2011. His final two Le Mans races were much more successful. In 2012 the veteran crew contested their last race together and finished in second place, one lap behind their younger teammates. At the end of that season Dindo Capello announced his retirement and was eventually replaced by Loïc Duval. McNish, Kristensen and Duval won the 2013 race giving Kristensen and unbelievable ninth win and McNish his third. The win was Duval's first. 2012 also saw the long awaited return of the World Endurance Championship. McNish's crew took podiums at every round to add to the Sebring win but could only take second place in the title behind the younger Audi crew. In 2013 the positions were reversed with the McNish crew taking wins at Silverstone, Le Mans and Austin along with second positions at Spa, Interlagos and Fuji to clinch the title. You have to wonder how many world titles McNish, Kristensen and Capello would have won had the championship existed during their entire sportscar careers. So having taken his third win in the big race and his first world championship Allan has decided to retire. The statistics of his career are very impressive. At Le Mans in addition to his three wins he has two seconds and four thirds making a total of nine podium appearances. Add that to the occasions when his car crashed while leading and it is a very impressive career. He also won Sebring four times with another four podium appearances and took six podium positions at Petit Le Mans including four victories. Then there are the three ALMS championships and of course the world championship. Not a bad collection of results for someone who was a washed up, failed F1 test driver unable to get a drive anywhere 17 years ago. Of course statistics can only tell you so much. When I think of Allan McNish I don't see the trophy collection. I see a car being driven right on the limit hunting down the car in front and John Hindhaugh revelling in the sight he is commentating on. The eventual pass when it happened was often an inevitability. Rally fans of a certain vintage will no doubt associate the legendary Markku Alén's favourite phrase with McNish. When interviewed before getting in his car at the start of a rally stage about how he planned to tackle it Markku would look at the camera with a twinkle in his eye and say "Maximum Attack". Allan McNish has given me a lot of great memories from that first race at Ingliston through the F1 saga to the final Le Mans win. As with any other fan I remember the accidents particularly the one in the Toyota at Suzuka and more recently in the Audi at Le Mans. I think I held my breath longer than he did during both of those. However if I was only allowed one memory of his career it would be from the ALMS. He spun his car on the way to the grid and had to pit and lost two laps having the damage repaired. Starting the race two laps down he was in maximum attack mode every time he was in the car. I can still remember all of us watching and commenting on the race as he closed on Christian Klien in the darkness. No-one for a second doubted that the pass would happen and I almost felt sorry for Klien because an angry and embarrassed McNish was never going to let up for a second. He hunted him down, passed him and disappeared into the distance to take the victory. Despite all the setbacks, accidents and disappointments I will always have the victories and epic drives to look back on and remember.